Loved by some, loathed by others, the concept of hashtags has been perhaps Twitter’s most divisive tool since its introduction in August 2007. However, 2015 has been highlighted as the year that the humble hashtag truly reaches maturity. Why should you use a hashtag? It’s simple; tweets with hashtags receive two times more engagement than those without, and tweets with one hashtag are 55% more likely to be retweeted. Hashtags act as simple signposts for the social community, directing them that your content is relevant to their interests and that it relates to a specific topic – despite the broad reach of social media, specificity is the best way to create an engaged follower base. Furthermore, they have now become a staple for journalists, both in sharing news to drive website traffic and for monitoring a developing story. Turn on any TV news channel and you are likely to find that they first few hours of a breaking news story are either informed or have sources photos and video from Twitter. Trending topics like #JeSuisCharlie clearly highlight the significance to the news agenda, appearing in 5 million tweets in the first three days alone and first appearing just a matter of hours after the attack on Charlie Hebdo. In the past year many businesses and industries have utilised the hashtag to promote engaged conversations with their audiences. Weekly debates centred around a specific hashtag, such as #PRtalk (one that I am regularly involved in), enable like-minded Twitter users to debate, discuss and answer common questions. Sports clubs have been quick to pick up on these, to great success, allowing fans to put their questions to managers and players, creating greater engagement and promoting transparency. Without understanding your audience and how they react to your content you expose yourself to the hashtag getting away from you. Be sensible and only create something that aligns with how you want your brand to develop. Don’t just jump on the latest trend on a whim. Here’s a couple of examples of great hashtags and those that failed miserably. While Twitter is the most commonly used social media for most brands, the hashtag has evolved beyond the platform and is now used across almost ever social network. However, that doesn’t mean you should be using them everywhere. Facebook introduced hashtags in 2013 but they have had little tangible success. In fact, recent studies have found that status posts without a hashtag fair better than those with them – posts with hashtags receive a 0.03% lower engagement rate on average. It is a similar situation on LinkedIn, where my advice would be to remove hashtags all together. They usually put people off more than anything else. However they have been a roaring success on Instagram, where posts with 11+ hashtags have the greatest levels of success. 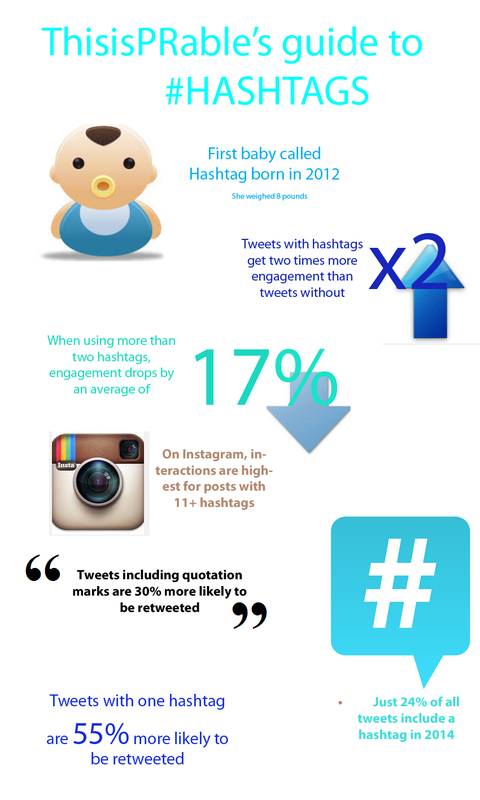 As with much of social media, there is no exact science in developing and promoting a successful hashtag for brands. The best advice I can offer is to experiment – know your audience and what they like, find what works and what doesn’t, and then replicate. Consistency is key so that the audience knows what to look for, and brevity really is a virtue – long hashtags simply take up too many characters to be successful. As ever, I hope this has been of interest and educational. But ultimately, I hope this will encourage you to go out and try something new, and #enjoy. I can honestly say that I hashtag love this. I will randomly use the word hashtag in daily conversations, just because it usually does tend to make people’s ears perk up. That to me is what a hashtag does! It kind of highlights a part of a post or campaign. It’s the take away. I really do see them only getting stronger. Hail hashtags! Like this post and great work on the infographic! You definitely covered all the key points but if I could add one more it would be the power of the short, concise (easy to memorize) hashtag phrase e.g., #fun vs. chosing to use a hashtag for a full comment e.g., #funsaturdayattheconcentwithmybffanddog. Sadly, I see it done too often!